If you like seeing exciting bruising football, you should have attended the Dalhousie Tigers/UNBF Red Bombers’ bash on Sunday afternoon at Wickwire Field. It was a return to old school power football by both squads. Turner Sturgeon, a 230 pound bowling ball, scored three running touchdowns. The last one on a short run with less than two minutes remaining to hand the Red Bombers a 35-31 victory. The second member of the bruise brothers was last year’s AFL Offensive MVP, Zack Leger. “Smash and dash” carried the ball 34 times for an amazing 220 yards and one major. Give some credit to the O line but a lot of those yards came after first contact. I am sure that both Zack and Turner are sporting their own bruises after their impressive performances but more importantly they have earned the respect of their bruised defenders. In this two game total point series for the Alumni Cup, the Tigers were left in the starting blocks as the Sturgeon brothers scored on runs giving the Bombers an early 14-1 in the first quarter. But the Tigers exploded on both O and D to take a 22-14 halftime lead. Leger’s run major and two quick TDs on passes from Chris Duplisea to Alistair Chauhan and Zack Kuhn within three minutes, saw the black and gold up 22-14 at the half and only down nine points for the Cup. Tiger fans were now on their feet looking forward to the second half. A strip fumble and recovery by Dal saw the “mo” continuing in the third quarter. Excitement waned as a short Tiger march stalled and Sturgeon scored on a 17 yard romp. Another short drive saw Dalhousie miss a field goal but on their next possession the Cats would score on a 31 yard hookup from Duplisea to Jack Underhill. Dal had regained the lead, 29-21. Next Tiger series saw a long Leger reception negated by a penalty. One of too many flags (15 for 140 yards) which again stemmed drives or continued opponents’ marches. This young Tiger squad needs to eliminate objectionable conduct and unnecessary roughness penalties if they expect to win close games. Cam Caissie’s dash put the Red Bombers down 29-28 with 10:28 remaining in the 4th quarter. 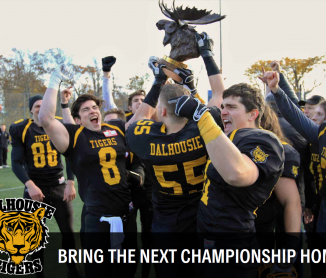 The balanced Dalhousie offence contributed an admirable 284 yards on the ground and 212 in the air. But a third and two situation had some armchair QBs debating whether a punt or a run would have been better than an incomplete pass which left UNB with good field position. Sturgeon’s third major, a short plunge, gave UNB a 35-31 lead. With 1:33 remaining on the clock, everyone was excited as Dal had one last opportunity to win the game. They were hoping that Duplisea could lead an Aaron Rodgers’ type march. A long completion on a great catch by Underhill saw the fans on their feet and the thunder sticks clapping. But on three downs from just inside the ten, the Tigers came away empty. Dal’s D had stopped the aerial attack that had caused the 17 point loss a few weeks back. But the ground pounding was their nemesis this time. Standouts for the Tiger D were Tegin Davis with two picks and 5 tackles while Samuel Jennings-Lindsay had five tackles and a fumble recovery and Liam Manson had six solo tackles. Coach Haggett was proud of his young chargers team effort and feels their future is bright. The Tigers final regular season game will be played on Saturday at Holland College and coach feels that on any given Saturday the black and gold can come up winners. Shout outs to the Dal cheerleaders on a fine afternoon performance. To Ashley Murty and her game day crew and to the boisterous and well behaved Homecoming crowd. Hope to see some of you on the road for the playoffs. GO TIGERS!!! !